Freddie Frisby is informed by Bob Sears that he can't marry Bob's daughter, Judy, as he is only a fumbling failure as an orange picker, and Judy can do better. Freddie's prospects brighten up when he learns his uncle has left him his entire estate, but he learns that the estate consists entirely of a magician's paraphernalia. 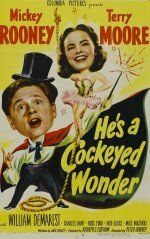 He decides to become a magician with Judy as his assistant, but while they are rehearsing, they are kidnapped by a band of payroll robbers.